Ethics statement: We bought the Mini 70 for our personal use. We were not asked to write anything about the camera, nor were we provided with any sort of compensation. Within the article, there are affiliate links. If you buy something after clicking the link, we will receive a small commission. To know more about our ethics, you can visit our full disclosure page. Thank you! 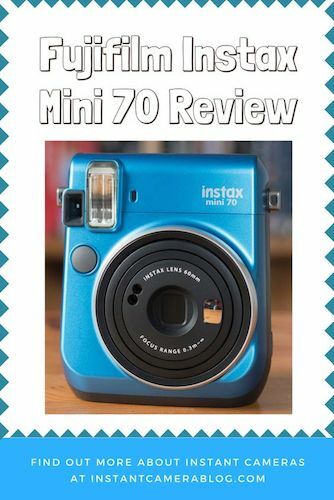 What is the Instax Mini 70? 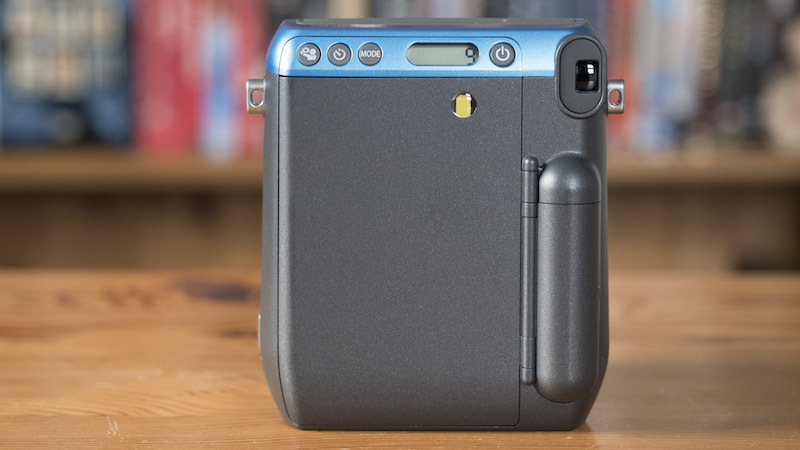 Released in late 2015, the two-year-old Instax Mini 70 can be labeled the “mid-range” model in Fujifilm’s series of instant film cameras. It is a more complete package than either the Mini 8 or Mini 9 but lacks some of the more advanced controls of its high-end sibling, the Mini 90 Neo. As of today, it comes in six official colours: passion red, stardust gold, midnight black, moon white, canary yellow and island blue. 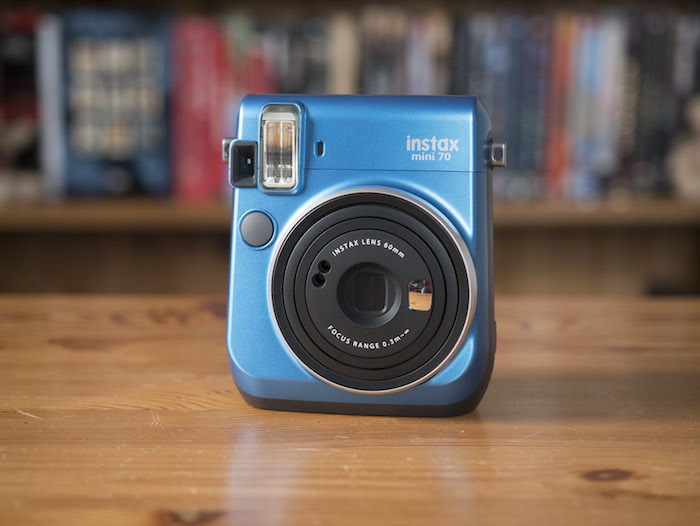 >> To find out how it compares to the Instax Mini 9, check out our full comparison! 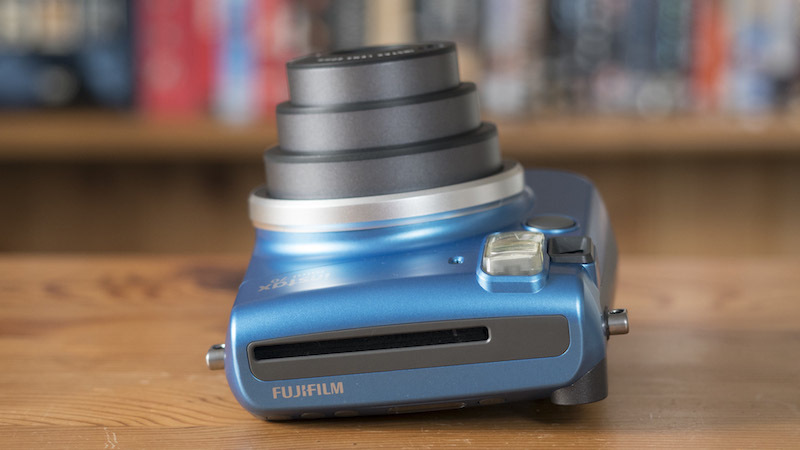 The Mini 70 has a sophisticated appearance that appeals to the younger generation and more mature photographers alike. Whereas the Mini 8 and 9 are characterised by their round edges and “bubblegum” appearance, the Mini 70 has a sleek design with sharp angles and a handsome metallic sheen that brings out the colour of the body. 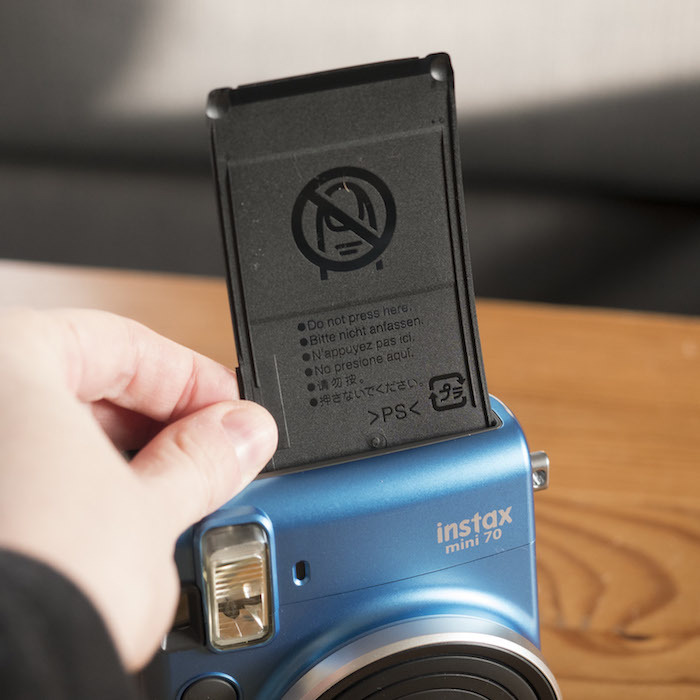 The body isn’t what you’d call pocketable, measuring 99.2 × 113.7 × 53.2mm and weighing 281g, but it is certainly one of the smaller and lighter Instax models and is very comfortable to carry around at your side when attached to a strap like the Peak Design Leash (review here). I’d also suggest using a strap because the body is made of plastic, and if you were to drop it on a hard surface, it would probably start to malfunction. 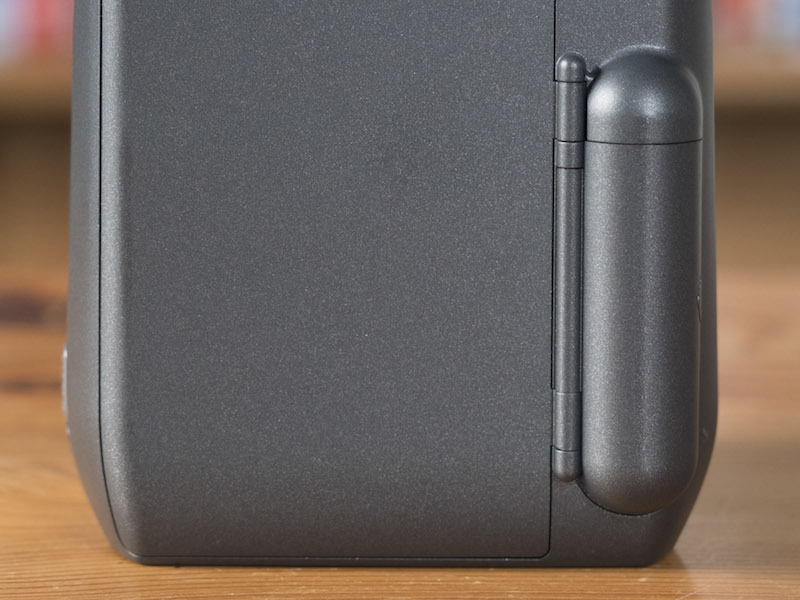 There isn’t a grip on the front but on the rear you’ll find a tube-shaped thumb rest that is also home to the batteries. It isn’t as large as the grip of the Mini 9 but the handling of the camera is certainly much better for it. 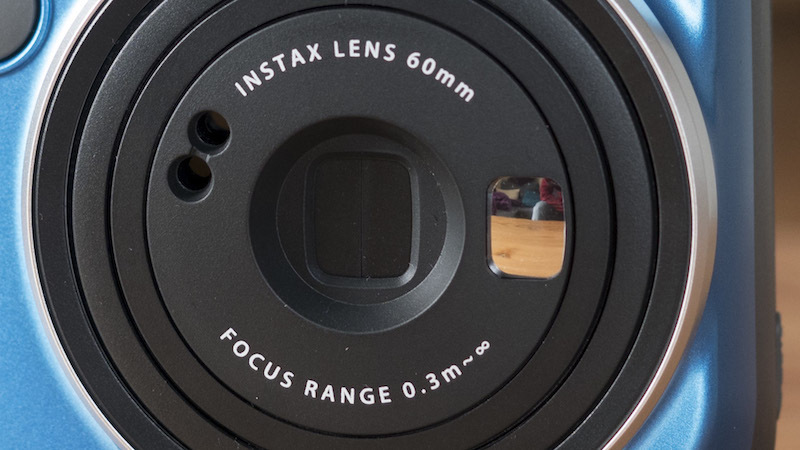 The pop-out lens is fixed at 60mm (or 34mm in 35mm equivalent terms) which is a good choice for a number of genres including street, travel, portraits and more. Turning the camera on releases the lens, turning it off retracts it. Note for the techies: The aperture value of the lens is fixed at f/12.7 but the shutter speed changes according to the light conditions (between 1/2 – 1/400 of a second). 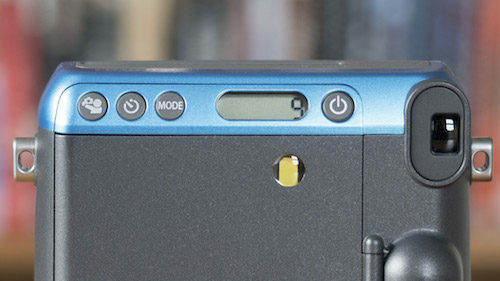 If none of these modes are selected, the camera will automatically set the distance to 60cm – 3m and choose the most appropriate settings for you according to the light conditions. In low light, the camera will choose a speed down to 1/2 a second, whereas in bright conditions, it can go as fast as 1/400 of a second. Also on the rear is the film door and a small round window. Because it aligns perfectly with the yellow strip on the film, you can always tell whether or not a film pack is already loaded. On the left-hand side of the lens opening, there is a small selfie mirror that helps you compose the perfect self portrait when in selfie mode. It works well, even when two people pose for a selfie together. On the other, there is the light meter which reads the ambient light of the scene and tells the camera what shutter speed to use and whether or not to fire the flash. Overall it is pretty accurate, though I have found that the flash doesn’t always fire when it should in automatic mode. Turning to the front, we find three of the most important physical features in close proximity: the optical viewfinder, flash and shutter release button. The viewfinder is in portrait orientation, just like the resulting Instax prints. Within the viewfinder is a circle that not only identifies the centre of the frame but also helps you avoid parallax issues at close focusing distances. Put simply, parallax means that the lens doesn’t “see” the same composition you do through the viewfinder due to the fact that they are a few centimetres apart. 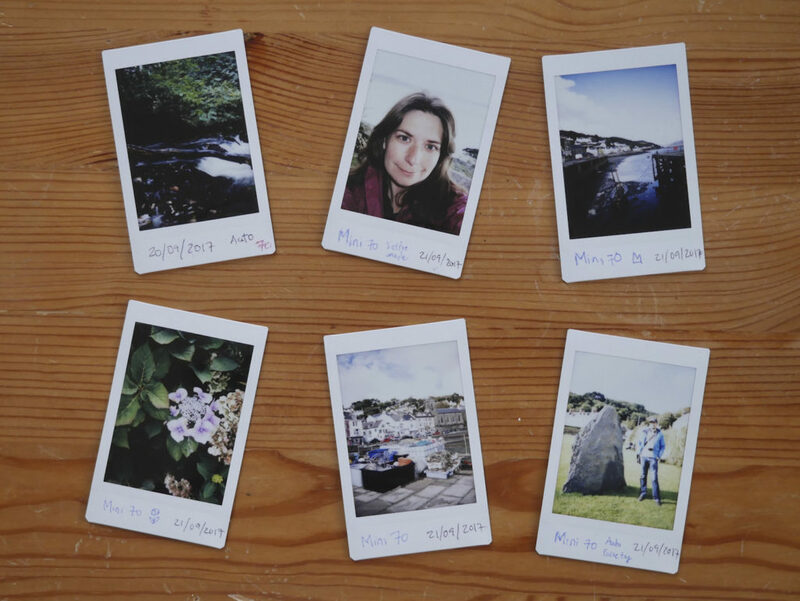 >> Find out more about parallax affects the viewfinders of Instax cameras here. It has quite a low magnification of 0.37x, which means it can be tiring to look through for a long period of time. 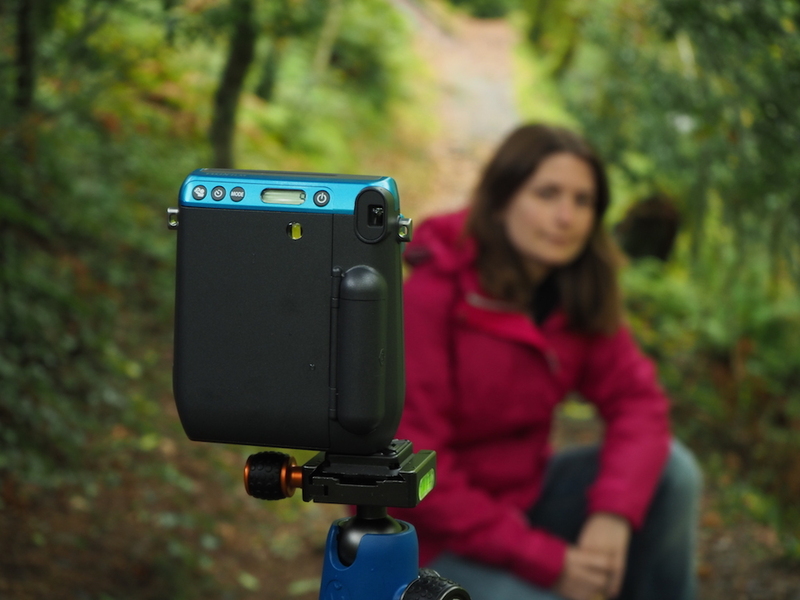 The flash has a range of 30cm to 2.7m and a charging time between 0.2 and 7 seconds. It is important to avoid covering either the flash or the aforementioned light meter as they work together to deliver the correct exposure. 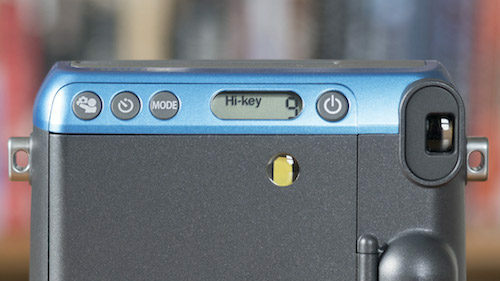 The top part of the camera is occupied solely by the film ejection slot. 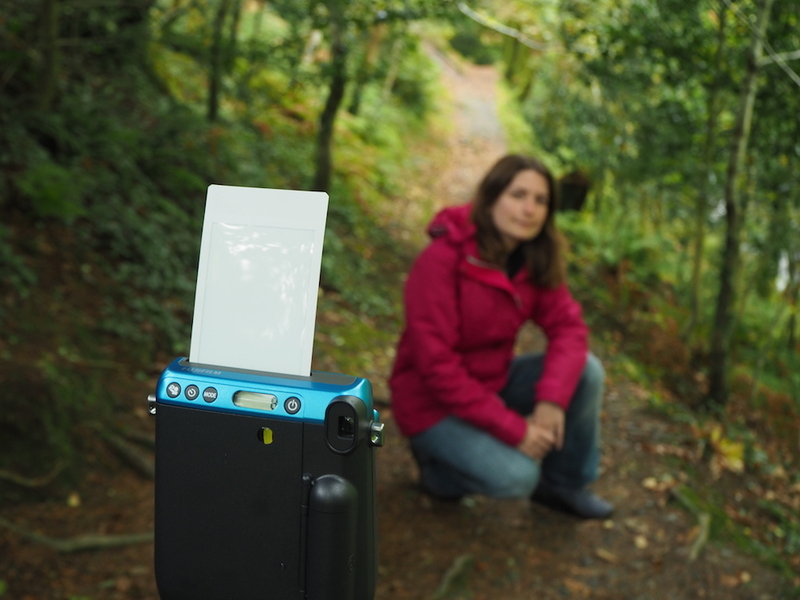 After pressing the shutter button, the camera ejects a single print that takes an average of 1-2 minutes to develop. 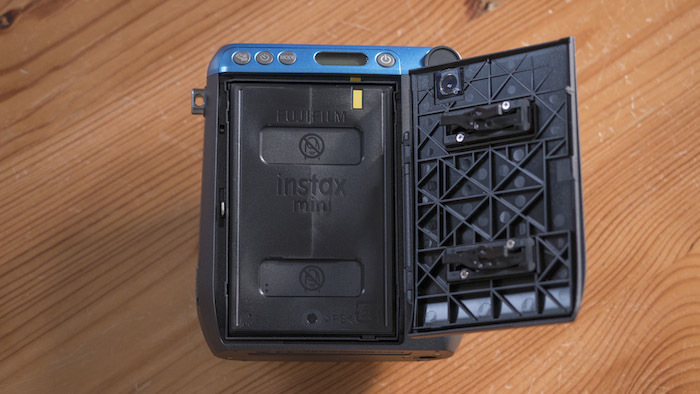 During the ejection process, it is important that you don’t block the slot or pull on the image before it has been fully ejected – otherwise you risk damaging the camera and the film! The bottom of the camera is home to the tripod mount, which comes in handy when you want to use the self timer to take group shots or self portraits at a distance. 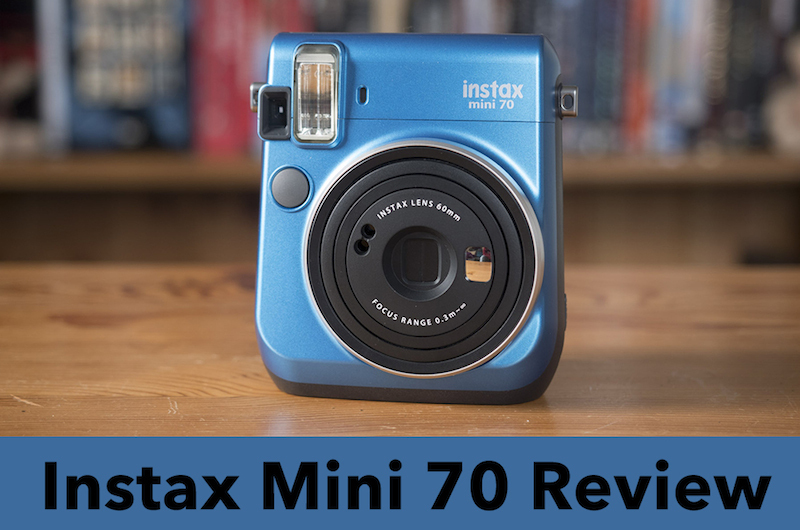 From loading the film to taking a shot, it is difficult to find a camera that’s easier to use than the Instax Mini 70. That said, there are a few instructions you need to follow. After removing the camera from its packaging, the first thing you’ll need to do is load the camera with two brand new CR2 lithium batteries. Be sure to do this while the camera is turned off. If you use partly consumed batteries, you may find that the camera won’t turn on or that it won’t take any pictures. This is because a quick, high-current draw is required for the flash to charge. The second step is to load the Instax Mini film. To do this, open the film door and without touching the two rectangular openings on the back of the film cartridge, slide the film into place by aligning the yellow markers on the film and camera. Once in place, you can close the film door. Next, push the on/off button on the rear to turn the camera on and press the shutter release button once to eject the black film cover from the film slot. You’ll notice that the counter on the screen will display the number 10. 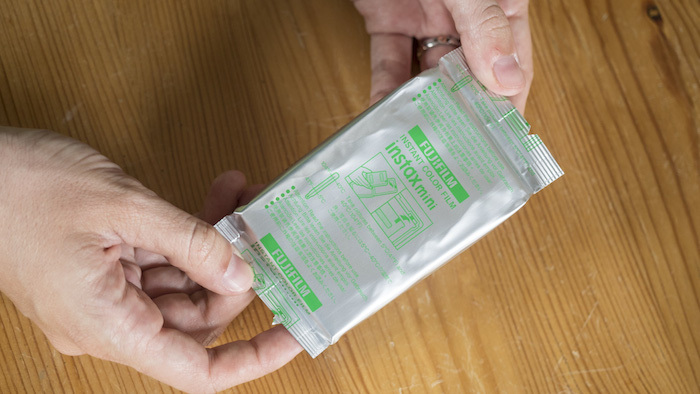 The Instax Mini 70 will only accept Fujifilm’s Instax Mini film, which contains ten shots per cartridge. Each cartridge costs an average of $10 but you can often find better prices if you buy them in bulk. With measurements of 6.2cm x 4.6cm, each frame is approximately the size of a business card. Its speed is ISO 800 whereas the colour temperature is 5500°k (daylight). When you manage to nail the exposure, the colours are punchy and pleasant and the glossy texture of the film gives the image a 3D pop. There is also some mild vignetting in the corners which gives the film a vintage appearance. That said, the film doesn’t handle extremely bright scenes very well. It will almost always turn out overexposed, especially if there aren’t any clouds in the sky and you’re out in the midday sun. You may also come across black speckles in the extreme highlights. 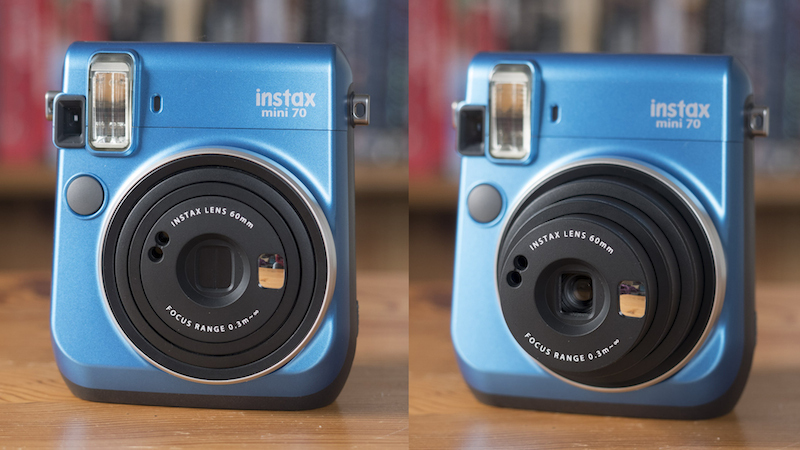 For those who find the toy-like appearance of the Mini 8 and 9 unappealing, the Instax Mini 70 is a near-perfect alternative. Not only does it have a more sophisticated design but it also offers a few additional features in comparison to its entry-level siblings such as self timer, a tripod mount, a lens that adjusts its range according to the proximity of the subject, more flexibility in low light thanks to its slower shutter speeds, and a better battery capacity. Not all is sunshine and rainbows however. The optical viewfinder remains quite small and occasionally the flash fails to fire in automatic mode, even in poor lighting conditions. 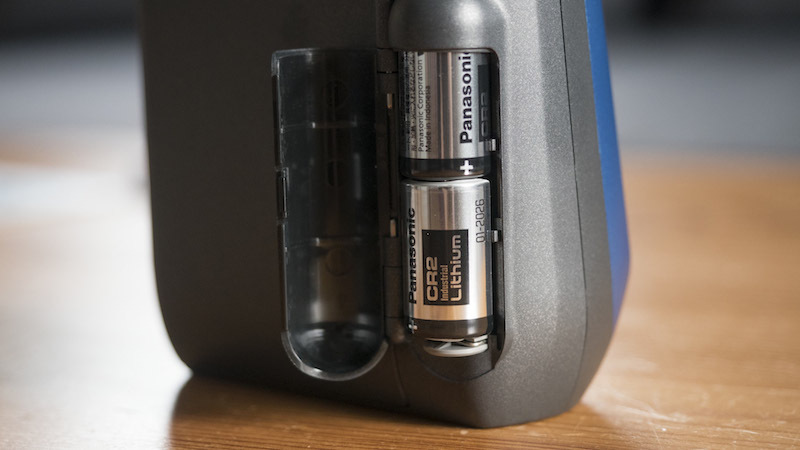 What’s more, while the CR2 batteries are more powerful, they aren’t as ubiquitous as the AA batteries the Mini 8 and 9 use. Finally it would have been useful to have a faster maximum shutter speed so as to circumvent the issue of overexposure in broad daylight.